Gregory Luce was born in Dallas and raised in Texas, Kentucky, and Oklahoma. He has lived in Washington, DC, since 1980, working for most of those years as a production specialist at National Geographic. 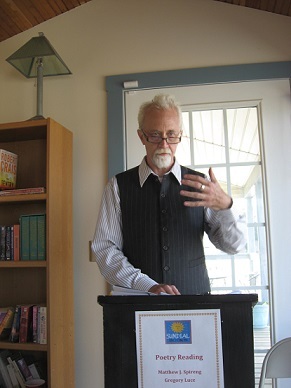 His poems have been published widely and he is the author of 3 books of poetry: Signs of Small Grace (Pudding House, 2010), Drinking Weather (Finishing Line Press, 2011), and Memory and Desire (Sweatshoppe, 2013). In May, he won the 2104 Larry Neal Writers’ Award in Poetry for a DC-Based Writer—which seems fitting, as his poems often reflect the day-to-day of living in DC. He is interviewed by his friend and fellow poet Naomi Thiers. Naomi Thiers: You describe the experience of weather and the elements on your senses/body– especially sky and clouds, but also rain, wind, and the quality of the air or light—more than any poet I know. I don’t think one could read a sampling of your poems without getting a clear mental picture of the sky! Why do you think you write so much about the look and feel of natural elements and weather? Gregory Luce: Growing up on the Great Plains as I did exposes one to all kinds of weather, including some real extremes. I have a great fascination for and emotional response to the sky and clouds and thunderstorms and sudden changes in weather that I assume I acquired out there. Now that I am getting older and have been living in the East for so long, I find myself growing nostalgic for scenes and events from my childhood and youth, and also flooded with memories. My work has occasionally taken a narrative turn recently and much of it, especially in Memory and Desire, recalls that time. NT: I know you walk around DC a lot. Do you think that’s partly why you write about the elements so much? Do you often start a poem in your head as you walk around outside? GL: Indeed. I often see some configuration of buildings or trees and sky that strikes me for some reason; or I might see an interesting face on a bus or the Metro. Broken glass glittering in streetlight or a tiny slice of moon in the sky moves me, as often do the reflections in shop windows when I’m walking around. Many of my poems begin with observations (or even phrases that enter my mind) on buses or trains; I think there’s something about the rhythm of those conveyances that accords with my sensibility! if that thick breath is his/or yours. Do you try to create a certain emotional tone in a poem? Is there one mood that finds its way in a lot? GL: I seem to get a great deal of my inspiration in times of quiet reflection or observation; I think it often arises when more routine distractions (work, eating, interactions with friends and family) are absent. Besides the rhythm, I suppose I get a lot of ideas on mass transit because a bus or train ride is a period of enforced idleness. In any case, it does seem that the darker or just calmer moods find their way into many poems, perhaps because one might say they are quieter, less obtrusive moods that I feel more fully once distractions are peeled away. NT: You have many poems in Memory and Desire, about waking up in the morning, that have a mood of bleak struggle, of fighting your way toward the light—sort of anti-aubades! I think these poems would resonate with a lot of people, yet many poets find they wake up with rich words and images in their heads. I’m curious–do you find mornings a time of creativity, or depression—or both? When is the most creative time of day for you? GL: I frequently have difficulty sleeping—insomnia is a recurrent theme in my poetry!—so I often wake up with difficulty, feeling anxiety or still very tired. I seem to write best and really get into the flow starting toward the end of the evening. It is not uncommon that I write in bed late at night. NT: Your poems also have a lot to say about joy, especially the intense joy one can get from looking at ordinary things and finding the gleam in them. This seems to be a theme in your book Signs of Small Grace. Am I right? subject is a feeling, say, or an experience of weather. I want my readers to take a fresh look at the things around them, even the seemingly most mundane, and see their unexpected beauty. Hopkins might say I’m trying to show these things’ inscape. 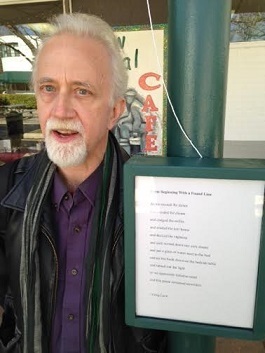 The poem “Just Look” that opens Signs is as good an ars poetica as any I could devise. I would also mention the poem “Thrall” from Memory and Desire for those who want to see the joy—and emotional cost—of pursuing this end. NT: Is the reader essentially important to you? It would also be interesting to know how you conceive of and interact, yourself, with the world and language, that is, what is your own private relationship with experience and using language to explore it–your own inside view during the time of writing, beyond your relationship with readers. GL: I do write with at least an imagined audience in mind; I believe that art without an audience is merely private experience. I think the Poem “Thrall” that I mentioned earlier expresses the way I interact with the world—how it presses itself on me whether I like it or not (and I do, mostly). I also see a process aspect to your question: When I move from initial inspiration—perception, image(s), phrase—and am actually writing, I am usually in a state of flow and not consciously manipulating the materials, other than considering what specific word or words might work best in a specific place. I seem to use a lot of assonance and internal rhyme, but I am not necessarily trying to do so as I compose; it seems to be something I’ve internalized as a practice over many years of writing poems. NT: You were raised Episcopalian, a “preacher’s kid,” and you’ve been a practicing Buddhist in the Tibetan Shambhala tradition for several years. There’s a sense of spiritual seeking, of groping for how to relate to the idea of God—and also a sense of spirituality suffusing the natural world—in poems like “Uncommon Prayer” or even “Burden at 2 AM,” which quotes Job as it describes being hung over. How would you say your spiritual beliefs affect your poetry? GL: I think what I described above about trying to reveal unexpected beauty and joy, along with my attempt to describe feelings of sadness, depression, anxiety, and uncertainty in a way many people can identify with, is a spiritual practice. I think one of the things that drew me to Buddhism is its emphasis on seeing reality clearly and truly and another is its teaching that the self is not as solid and separate as we tend to think and that all beings suffer and experience joy similarly. I hope my poetry gets at some of that way of seeing. NT: What poets do you feel have influenced your work? And who are some of your favorites to read? GL: William Carlos Williams and Robert Creeley have been the two most important poets for me in finding my voice and in terms of craft and language. Creeley in particularly helped curb my natural verbosity and pushed me toward terseness and concision; both of them were major creators of a modern American idiom that I find especially congenial. Rilke continues to inspire me and remind me that writing poetry is a spiritual practice as well as an artistic pursuit. Likewise, Charles Wright, whom I consider the greatest living American poet, and who was kind enough to read and offer generous praise for Memory and Desire. And I have to mention the poet who I think inspired me to try writing when I was a very young child and provided my first taste of poetry beyond nursery rhymes: Robert Louis Stevenson. My grandmother read A Child’s Garden of Verses to me and as soon as I could read I devoured it many more times. I also read often and with great pleasure Keats (“Ode to a Nightingale” is my favorite poem), Wallace Stevens, Frank O’Hara, Robert Lowell, Sylvia Plath, Moira Egan, Marina Tsvetaeva, Gary Snyder—and you, of course ! NT: I don’t think this question gets asked enough: Who are some of the best poetry teachers or mentors you’ve ever had? GL: When I was in graduate school at the University of Southern Mississippi I had a very close friend named Carol Poster; though she was younger than I she was already a highly accomplished writer. She pushed me to reconsider everything I thought and believed about poetry and my style and almost ruthlessly drove me to carve down poems into their essence. More than anyone else she helped me create the voice and style I still have today. I have also benefited greatly from participating in writers’ groups; the giving of feedback is as helpful as receiving it. And the fact that I always get to read your new work and show you mine has been of enormous benefit. I love the way you and I push each other to do better work. Naomi Thiers was featured in our Winter 2014 issue. For that interview, please click here. 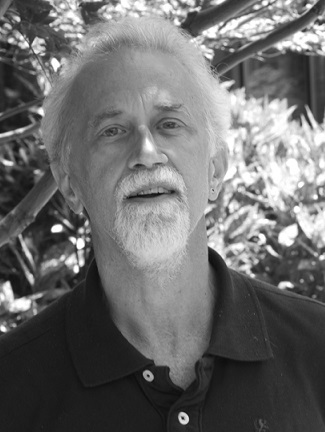 Visit Gregory Luce’s poetry blog.